I put them deliberately in that order because that is the order in which they were chosen. Readers are familiar with my love of green as a way to break the tyranny of navy and grey, and I wanted to wear these new Paul Stuart green-linen trousers. Next choice: colour of jacket. This could be grey but the contrast would be tricky. Navy would be fine, as it always is, but more formal and less obviously summery. So we try my tan linen/wool jacket from Elia Caliendo, which works nicely with the green. Both are strong colours, however, and from now on the other aspects of the outfit are made in their support. So what colour of tie? Again, navy would always work; perhaps my favourite garza-grossa grenadine. Grey might also do; I have a lightweight grey cashmere that might be good. But we could probably do with some pattern, and nice to stick with the theme of casual colours. 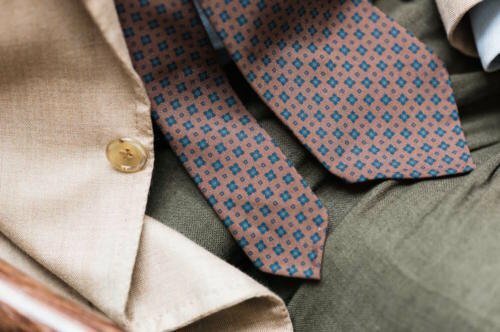 The chalky texture of the tie means there is virtually no contrast between shine and matte in the outfit, and just one elsewhere would be jarring. So we pick a linen handkerchief, whose cream colour further reduces the contrast, and brown suede shoes (Stefano Bemer; Goodyear-welted on my bespoke last). Six choices in the end, with each more dependent on its predecessors than the last. If I have one way of dressing, it is normally this: picking one thing I want to wear and working backwards. I’m not going to argue that it’s the most effective method, but it does mean I’m excited about one thing every day. And that I wear a lot of brown shoes. 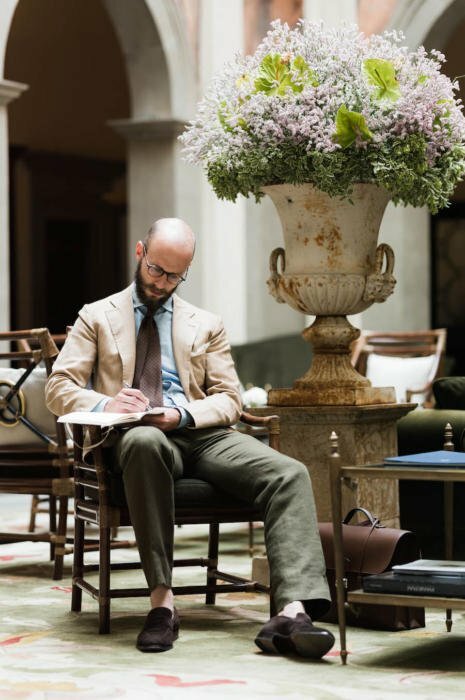 Photo taken at the Four Seasons Hotel, Florence; writing notes for the Tailoring Symposium later that evening. You can follow the discussion on Getting dressed: Tan jacket and green linen trousers by entering your email address in the box below. You will then receive an email every time a new comment is added. These will also contain a link to a page where you can stop the alerts, and remove all of your related data from the site. Thank you, Simon! I really enjoyed this article. You should write more often such type of articles where you explain your choices for your outfit. It is not about copying, but about developing a mindset of how to create own combinations. Truly smashing combo. I must admit, your emphasis on green has percolated my clothing choices. Whereas before i had a single dark olive tie and a bottle-green hank; i have added several shades of green item, almost to the fact that i almost always wear a green tie most times i wear a jacket. As to your arrangement above, as i am sure you have ad nauseam now :’no socks’. It is not a look i care for, especially when you wear a tie/ jacket. The tie is truly spectacular as is the jacket. Beautiful hotel. Converted from an old convent. Lord knows how much they invested! Great rig Simon. I don’t imagine you are making your notes with a Bic brio. You’ve written about watches before; does your interest extend to pens? It does, and I’ve written about how to buy a good pen before on How To Spend It. I’ll do another one though. Can you go over the logistics of your operation? Do tailors offer you discounts because you are a successful blogger? Do you occasionally get “comped” a piece or two because you are promoting a tailor? I’m curious to know about your fabulous life – or, conversely, to know the reality of full-price commissions. It’s something I’ve gone over a lot but don’t mind doing so again. Most tailors and other brands offer me discounts, but it is rarely free. Either way, however, it really makes little difference, because I am not going to buy something simply because it has a higher discount. I have too much stuff already – there is no point getting something that is cheaper if I’m not going to wear it because it is not the same level of quality. That might be attractive for start-up bloggers, but not for me. I never had the sense that you were peddling something for a third party. You skew towards covering the most storied tailoring houses (I’ve learned a lot from you). I was just attempting to (further) live vicariously through you. You have a splendid life. My fantasy is a Cifonelli wardrobe. Can’t imagine there’s a better tailoring house in the world (emphasis on “imagine”). Cool. Always worth stating that stuff now and again in any case. It’s frightening how many PRs email every day asking what my rate is for coverage. They used to ask about adverts. To be honest there are a lot of things in their style which I do not like anymore. And the insane amount of hand work is pure decoration. There was recently an article in Internet where a suit from Smalto (another very famous French tailor on the same price level as Cifonelli) was taken apart and they found out that while everything visible on the outside was hand made with extreme attention to the detail (the level of finishing is very similar to Cifonelli), the lapels were machine padded. I was very disappointed, because this means that its more for the show than for the philosophy of doing the perfect garment. They do everything visible nice and take short cuts for stuff that you can’t see. And the hand made lapels are pretty important for me because they help for better lapel roll which I like. Ok, well this was not a Cifonelli, but a Smalto. But they are in the same league and I will not be so fanatic and trustful anymore. I prefer smaller houses with much smaller production volume (like Musella Dembech). If you find the good ones, they can be much better in fit and make than the famous big houses. From the big names I am only tempted to try Gieves & Hawkes and it is only because of Davide Taub who seems to be very talented. I agree on many of the styling aspects at Cifonelli, and you’re absolutely right that much of the hand-work is purely decorative. Simon, this is a fantastic article! The steps that you go through in putting together the outfit in terms of color, fabric,finish etc is very helpful. Your emphasis on green is very interesting, particularly now that it’s Summer. I agree with Hristo that more articles on your process of outfit choices would be welcome, as your taste level and knowledge are clearly improving. One thing i’d lionise Simon for is his ‘exquisite taste in ties’. Sure, some are safe choices but they are all in ‘good taste’. One need only to look around mens necks or the racks and see what passes for ties these days. Of course it is easy to say, ‘he patronises the best tie-makers so…’ but speaking as someone who does not believe there is a direct relationship between quality and aesthetic of tie with more ££ evidenced by the fact that some of the very best tie-makers churn out clunkers among their inventory. I have a very olive grenadine necktie. What colours of jackets/trousers/shirts would go best with that? Are there any colours to avoid? For example: creme shirt, olive trousers, charcoal jacket/navy jacket — would these work, or would you avoid them (I heard somewhere to avoid olive/creme and olive/blue combinations and olive/tan combinations — but that may be wrongheaded)? It’s hard to say whether those pieces would work without seeing them, but there’s certainly nothing wrong with those combinations you list. You kept those trousers and turned to the more formal blue jacket for the evening Symposium. Am I right? I really like that you change outfits! So many,if not most, men will wear the same clothes to dinner that they’ve worn all day at the office,on vacation etc. The concept of dressing for dinner or an evening out is lost on the vast majority of men I’m afraid. Suimon – could you pls identify the source of the jacketing cloth? Looks great, and I’ve been on the hunt for something similar. Thanks. Interesting thought process. I would only deviate on the tie. When going casual I always go for a textured tie – knitted, cashmere, woollen – and never a straight silk tie, which just looks too formal to me for an outfit other than a suit. Always the contrarian, I’ll just say that getting dressed should never be an academic subject! It’s just instinct and experience. That and good taste (hopefully). My wife complains that I’m slow getting dressed. I’ll show her this piece, Simon! This is definitely a “chic” outfit! Interesting how you compose your outfit! I think it’s the more effective way to sharpen your sense of style. Which is most/least formal: gun club check, Prince of Wales, and houndstooth? Either the camera is playing tricks, or there is something sprezzatura going on with the tie, reversed so that the rear blade is worn at the front? Perhaps something picked up from this year’s Pitti? Nice outfit Simon. Where’s the best place to pick up that kind of tie in London? Do Drakes sell 7 fold ties RTW though? Thanks. It seems frustrating and slightly absurd to have to go to a Hong Kong company to have Italian products delivered to the UK! I’m popping in to Anderson & Sheppard Haberdashers tomorrow to pick up some trouser – I wonder if they would consider importing them. Thanks Simon. As in the rear blade is simply not tucked into the loop, or the tie is literally put on back to front so that the thinner blade sits in front of the thicker one? Tie but no socks !? On another point of clothing etiquette , with polo shirts and T shirts , would u tuck in or leave out ? When is each appropriate without looking like a dad wearing socks and sandals. P.s. As much as I enjoy the articles the photos are superbly shot . Compliments to the photographer . I tuck in polo shirts 90% of the time. If you’re not going to, they need to be cut pretty short and square-bottomed, and fit very well. I rarely wear T-shirts except as underwear, largely because I think a collar is far more flattering. I agree that broadly a collar is much more flattering. I used to wear lots of t shirts as I was very fit and thin and could show off a rather (apologies for my lack of modesty) sharp collar bone. If you lack definition physically, however, collared shirts certainly suit better. Would you agree Simon? Great article Simon! I agree with the other commentators that this kind of insight into how you put together an outfit is incredibly useful; would love to see more like this. Good choice. A well done neapolitan work for the jacket, with the double stitching around pocket and lapels. The best fabric for the shirt, with this combination, is light blue “voile” cotton, a very light fabric with elegant shades of “azzurro”. I suggest, also, in less warm months, a “solaro” unlined jacket (especially the herringbone type) with olive green cotton or wool /cotton trousers. An airforce blue colour tie fits very well too. Really a great outfit, as always. I never wore gabardine or cotton clothes for “casual” suits (you know Spain is very traditional). I don´t like linen, as it gets wrinkles too fast for my taste. I was thinking in a tan cotton or gabardine suit, with a very formal cut. What do you think about it?. I just want to look sharp at the end of the day without leaving aside the fact that we are in Barcelona at summer! Thanks a lot, Simon. Any house that you may recommend for gabardine cottons? This time around, I have a question, if a bit off-topic. Do you have any rationale why you do have a lining on top of your Summer jackets across the back? One too many colours in this ensemble in my opinion. Ditch the blue shirt and go with white. Otherwise it looks great. Nice look with one exception – I hate patch breast pockets. They always look so nuff. Patch by all means but never the breast. My strongest recommendation. For 7 fold ties, try Viola Milano. Thanks. I have just found some via Exquisite Trimmings. You can even order bespoke for about the price of a Drake’s tie! I am giving it a go. A sophisticated palette. Takes taste and style to use multiple colors that harmonize, but do not match. Russet tie is the lynchpin. Great article and responses. You mention that the jacket has no back lining – have you gone for buggy lining or no lining? One other question re. socks; the colour matches the jacket and would also be my choice but if you were to be a little more alternative what colour might you choose (obvious might be brown or green but maybe a burnt orange)? In the tradition of Italian sprezzatura and casual British forgetfulness (Hardy Amies) you mention the ties’ twin blades (via Gianni Agnelli? ), an article on this philosophical approach to dressing would be great. Thanks Stephen. I’m actually not wearing any socks so it’s skin colour! Simon, I really like your jacket. I notice that the jacket is a linen/wool blend which give the jacket more of a true Summer look which looks very smart with rest of your outfit. I think that a linen/silk blend would also be very interesting for a Summer jacket, provided that one has the right shade of tan. What’s your opinion of the linen/silk blend idea? Doesn’t this break your no linen with linen rule? Or is the wool in the jacket enough to allow for linen trousers? 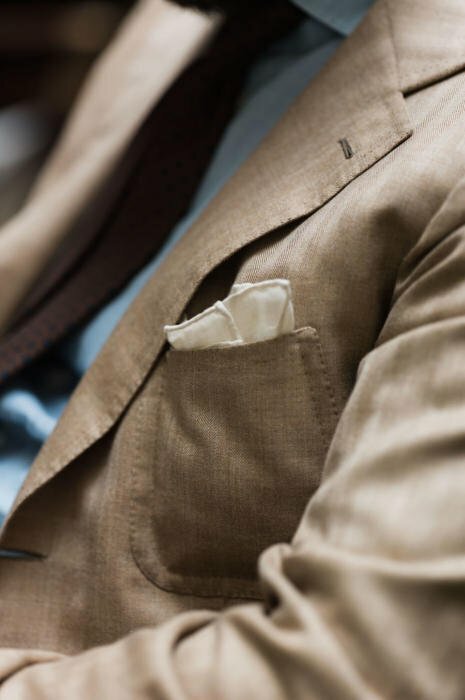 Yes, most jackets with fabric mixes are fine – the linen is rarely the majority of the mix, and as a result the texture doesn’t look that much like linen. If you’re concerned, look at the two textures together and consider whether they are too similar or not. Hi Simon. Love your green linen trousers and they’re a great match to the oatmeal jacket. I am a big fan of heavyweight linen trousers. Do you find linen trousers versatile enough to wear as odd trousers? Which colours would you favour? What principles do you follow to ensure adequate matching with a jacket (apart from sufficient contrast)?